›Daiwa TTU661MFS Tatula Bass Spinning Rod - Medium Power, 6 ft. 6 in. 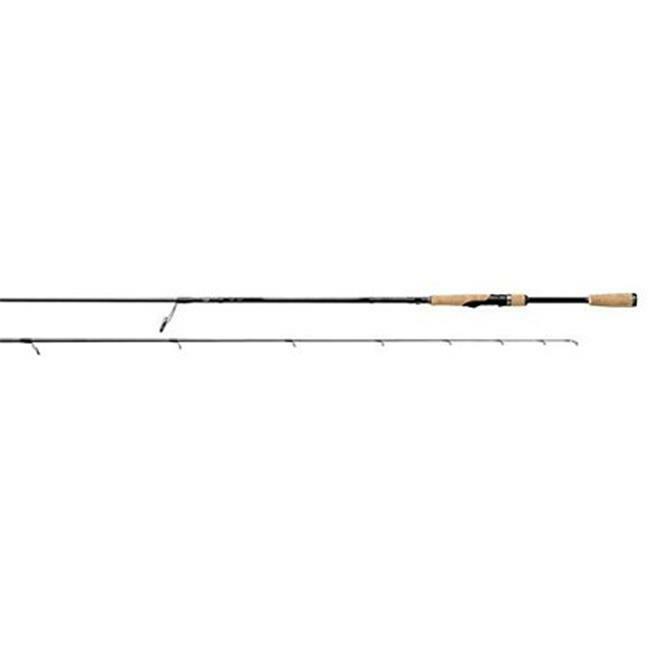 Daiwa TTU661MFS Tatula Bass Spinning Rod - Medium Power, 6 ft. 6 in. The latest Tatula line of bass rods are Finely Crafted with State of the Art Components. With Seven Categories of Rods and 21 different Bends the Tatula collection is a most complete professional collection of bass rods. There are 7 spinning designs, 6 casting models, 2 flipping rods, 2 shallow crank/jerkbait rods, 3 glass cranking and spinnerbait rods and a frogging rod. The beautifuly Crafted Natural Cork Handles provide timeless functionality combined with a sure grip. A slick Tatula Spider Graphic adorns the classic formed handles. The lighter X-45 concept blanks are rolled with Braiding-X Fiber Braiding Technology. The reduced weight blank resists ovalization alowing greater hoopstrength loads for a more precision load-up. The tangle free Fuji FazLite guides allow long accurate casts. If you are looking for a professional grade bass rod designed with a specific purpose in mind then take a look at the Tatula line of bass rods where built one just for the task. The latest Tatula line of bass rods are Finely Crafted with State of the Art Components. With Seven Categories of Rods and 21 different Bends the Tatula collection is a most complete professional collection of bass rods. There are 7 spinning designs, 6 casting models, 2 flipping rods, 2 shallow crank/jerkbait rods, 3 glass cranking and spinnerbait rods and a frogging rod. The beautifuly Crafted Natural Cork Handles provide timeless functionality combined with a sure grip. A slick Tatula Spider Graphic adorns the classic formed handles. The lighter X-45 concept blanks are rolled with Braiding-X Fiber Braiding Technology. The reduced weight blank resists ovalization alowing greater hoopstrength loads for a more precision load-up. The tangle free Fuji FazLite guides allow long accurate casts. If you are looking for a professional grade bass rod designed with a specific purpose in mind then take a look at the Tatula line of bass rods where built one just for the task.